The Olympic spectator experience, like the Games themselves, swings from exhilarating high to soul-crushing low. From the minute my family and I boarded the train to the airport in Moscow, we was surrounded by a buzzy atmosphere of excitement and anticipation. It was as if no one packed onto the Aeroexpress or on the completely full flight to Sochi had even heard any of the negative press surrounding the Games – or if they had, they certainly didn’t care. The flight was uneventful – although we waited at least 30 minutes on the tarmac so the plane could be inspected for security reasons. Despite the late hour – it was after midnight when we landed – the airport was bustling, but the information desk seemed set up to cope with team support personnel and some media, not ordinary tourists. There was no taxi stand and no sign for the train, and maybe for the first time in my life I found myself standing in an airport arrivals hall having really no idea of where to go. The first morning of competition, we headed to events in the Mountain Cluster. There was a security check before entering the train station. This was no surprise and I happily divested myself of all bags and jackets. Soon enough, we were seated in a brand-new high-speed train that would take us from the Black Sea coast into the Caucasus Mountains. Traveling this route, it was easy to see why Russia had chosen this location to host the Olympics. The scenery is stunning. 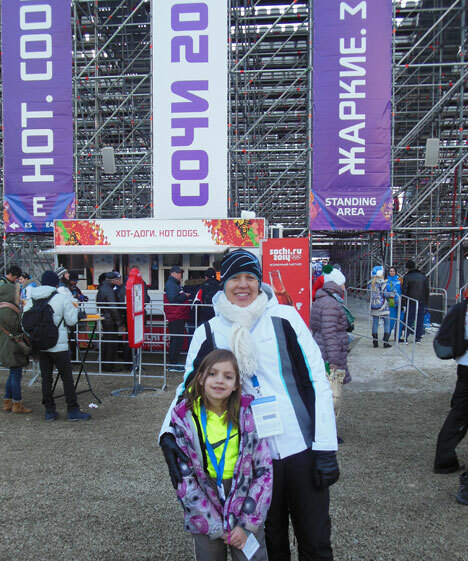 I had never been to Sochi before and I leave resolved to return – another goal of the Games accomplished, I guess. Signs at the transport hub of Krasnaya Polyana, the center of the Mountain Cluster were clear and there were plenty of volunteers also giving directions. It seemed at most times that there were actually more volunteers than spectators. We quickly hopped on a cable car to the Laura cross-country skiing stadium. It soon became apparent, however, that this journey was going to take far longer than I had anticipated – and not because of a crush of people or disruptions in transportation or service, which worked perfectly – it was just a really long way. Getting to the ski center took another cable car and a serious hike up some steps. Total time from Sochi to the sidelines of skiathlon: 2 hours, 10 minutes. But – we were watching an Olympic event! There is nothing – nothing – like being at an Olympic event. I didn’t even know what was going on, but watching the skiers go past and hearing the crowd scream and just there was exhilarating. We had amazing weather, the course was framed by gorgeous mountains, and I was full of the Olympic spirit. Then it was over. Our next scheduled event was three-and-a-half hours later – women’s moguls. It was also in the Mountain Cluster, but at the Rosa Khutor Extreme Park. And in the meantime, we had to have lunch. The restaurant in the transportation hub was full and so we decided to cross a small bridge into the ski village of Rosa Khutor. The restaurant there was full, too, but the bar was serving a buffet of small pies and soup, so we ate and – as it was now two hours from the start of moguls – headed toward the event site. I was prepared for the journey by bus to the site. I was not prepared for having to go through security yet again. Because we had left the official Olympic zone by going into Rosa Khutor, we had to undergo the full screening one more time. By this point I was using words like “excessive” and “burdensome” to describe the level of security. We hopped a bus to the Extreme Park, which was quick, efficient, and clean. But getting from the bus stop to the venue at the Extreme Park required an Extreme Walk so that by the time we were standing at the foot of the moguls hill, I was again thinking that there was no way I would ever do this again. Total time from lunch in Rosa Khutor to the bottom of the moguls hill: 1 hour, 45 minutes. But then the competition started. The music was playing, the competitors were skiing and flipping, and the crowd was going wild. A big contingent of Australians waved a flag with a giant kangaroo, the Russians chanted “Ros-si-ya!” and everyone applauded with sympathy for the skier who lost her ski in a jump and was disqualified. I love the moguls and, to those who asked, there is no comparison between being at the course and watching it on tv. None. It was the experience of a lifetime. Lara McCoy is the executive editor for the Western Hemisphere at RBTH. A self-described “Olympics junkie,” she went to the Sochi 2014 Olympic Games for fun, not work.